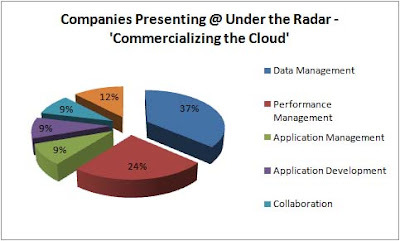 After looking at the companies presenting next week at the Under the Radar conference, “Commercializing the Cloud”, it can easily be seen which categories are getting most of the attention. Most of the companies, about 40%, are offering data management solutions for cloud computing environments. The solutions offered are not all exactly the same as some companies, such as AwayFind, specialize in email search. Others, such as Neo Technology, focus more on the database itself. The next largest category, with 27% of the companies, is Performance Management. I feel though this category might be slightly under-represented as performance in cloud environments is a big issue. When you add the fact that most environments are hybrid then the problem gets even worse. I was surprised, however, to see that important categories such as security are completely missing. There are interesting companies looking at this problem which will become significant as one company’s security vulnerabilities will be the risk for the rest of the companies using the same underlying hardware. It will be interesting to see how this distribution evolves in future cloud computing events.